Well here we are at the beginning of a new year, with Christmas already a distant memory, stressed out mothers glad their kids are back at school and mechanically minded father’s wondering why they didn’t receive that fitted out tool chest as a present, instead of yet more joke themed socks they will never wear. Whilst our good friend Dave Warby and his team in Australia prepare for further testing of their jet hydroplane Spirit of Australia II, struggling with their summer temperatures hitting a sweltering 47deg C, here in the UK the frost and snow of winter begins to bite. 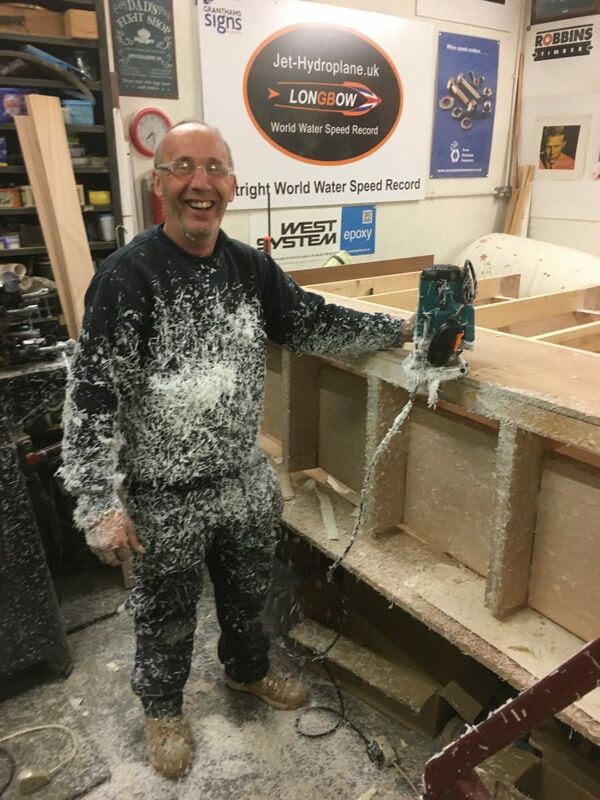 As discussed within our previous updates, low temperatures and high relative humidity at this time of year have the potential to play havoc with the moisture content of wood being used to form the hull of our jet hydroplane Longbow. Not only that it would make conditions inappropriate for the epoxy resin used to bond that timber. This being the case in order to constantly maintain an appropriate environment for using these materials, our heaters and dehumidifier are working overtime at the moment, even with our best efforts to insulate the workshop. For those of you who have not done any woodwork since they were at school, or indeed bearing in mind some of our younger followers who are still at school, a scarf joint is where you form a wedge, usually in a single plane to the end of each section of timber to be joined. The angle / ratio / gradient of each wedge varies depending upon application but these wedges must match so that they interlock. Angle / ratio / gradients are typically in the order of 4.7º / 12:1 / 8.3% up to around 7º / 7:1 / 14%, so for example a scarf joint at 4.7º to a 1″ deep plank would have a scarf joint running over a distance of around 12″. One may ask why within boat and aircraft construction this type of timber joint is favoured in a bending load situation over say a simple half lap joint and we hope the following sketches and information may help by way of explanation. The half lap and scarf joints are shown in sketches A and B respectively. First of all it needs to be appreciated that most of the cells in a tree trunk are parallel to the vertical growth and these cells form elongated fibres again that run vertically and make up the grain direction of the sawn wood. With a half lap joint, failure under a bending load will typically occur at the ends of the joint and along the length of the lap if the distance of that lap is relatively short in comparison to the depth of the planks. 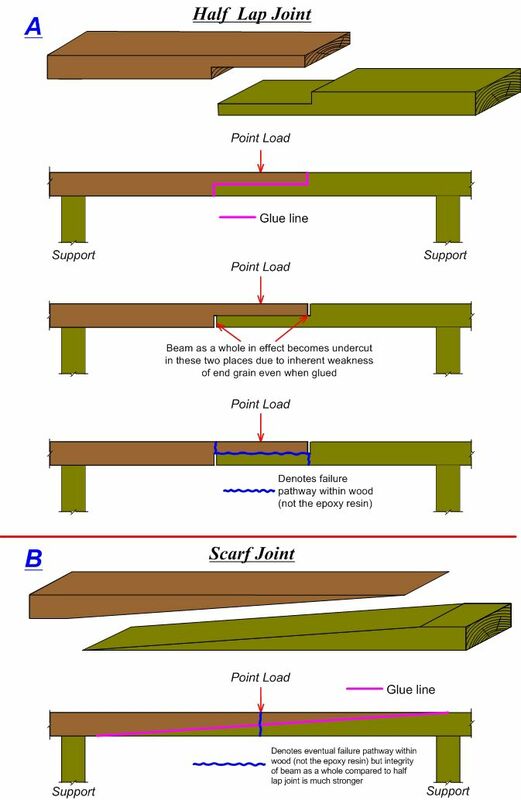 The reason it often fails at the ends of the joint is because the end grain of a section of timber is relatively weak compared with that which runs over its length parallel to the direction the tree grew; such that in effect what you have in relation to the timber beam as a whole with a lap joint, is it being weak / undercut in two places as shown in the previous sketches. It should be noted that the failure of the joint will usually be in the wood itself rather than the epoxy resin used to form the bond, as the latter is typically stronger than the wood it is being used upon. 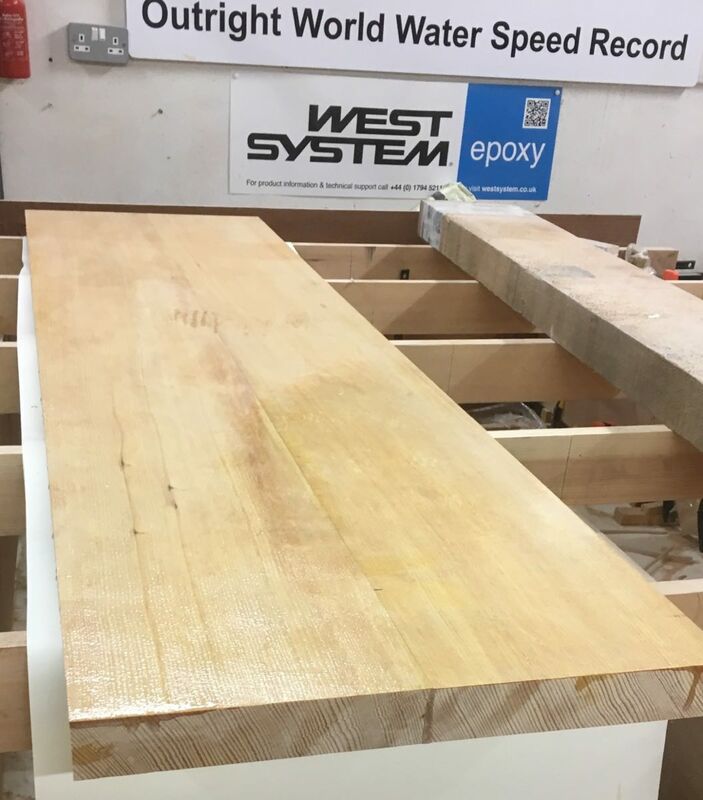 With a scarf joint where the wedges are in the range of the low angle / gradient mentioned previously, what you have is a glue line bond that runs along the grain over a considerable distance and hence avoiding the weakness of the half lap joint end grain. The bonded scarf joint therefore tends to act not much different from a continuous wooden beam without any joint at all. 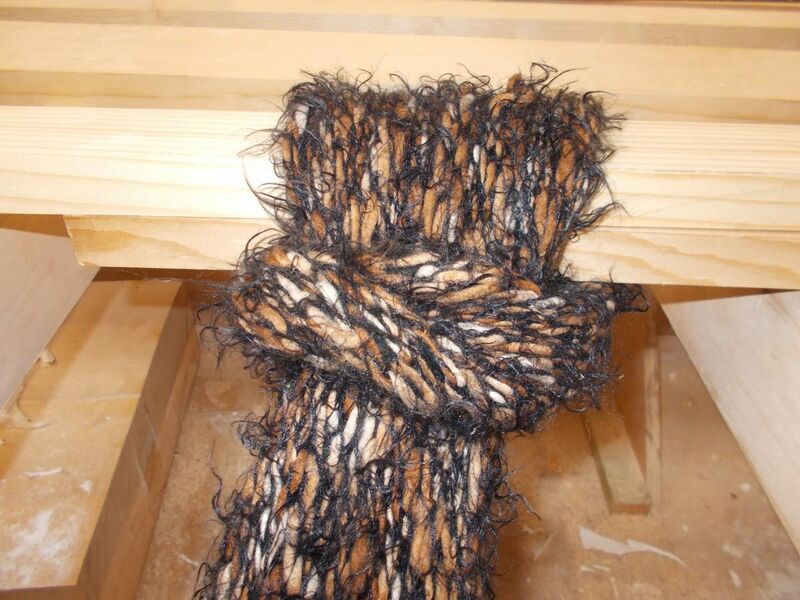 That is to say if the scarf jointed beam does eventually fail under a bending load, it will usually take more of a load to do so than the half lap joint in this type of situation with the failure in the centre of the scarf joint, much the same as it would be in the centre of a wooden beam without any joint at all. Having given the half lap joint a hard time in this explanation it does however come into its own where the loads are different such as when it is in compression and can be used with great success. 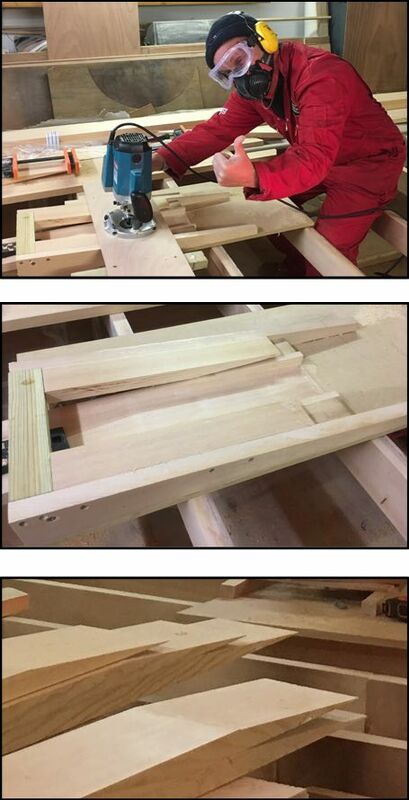 So having explained why we needed to make these scarf joints how do we go about forming them? Well you can do them by hand saw if you have the skill and patience but with quite a few of these joints to form, the best way that we found to form them was to make a jig to the angle / gradient required for the wedges and use a router. 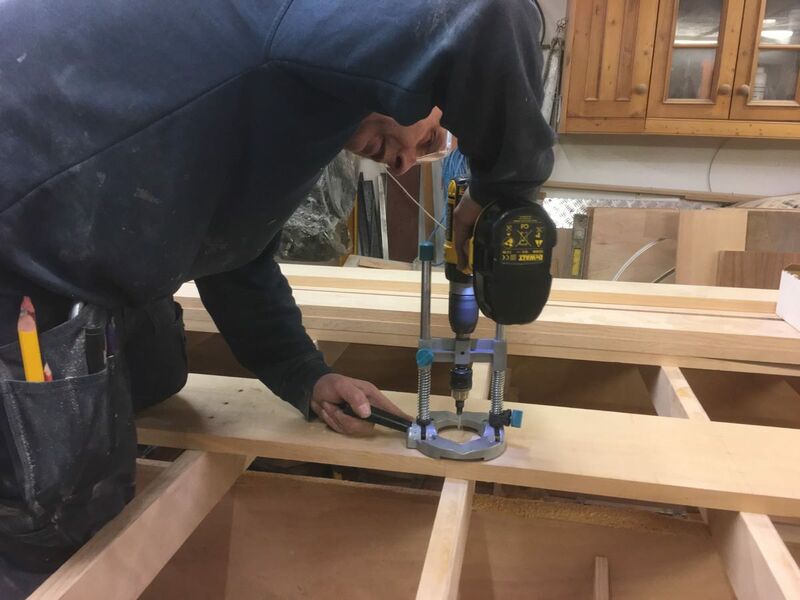 The following photo shows Steve forming some of these scarf joints using the router bits and PPE kindly supplied by Trend Machine & Cutting Tools Ltd, one of our product sponsors. 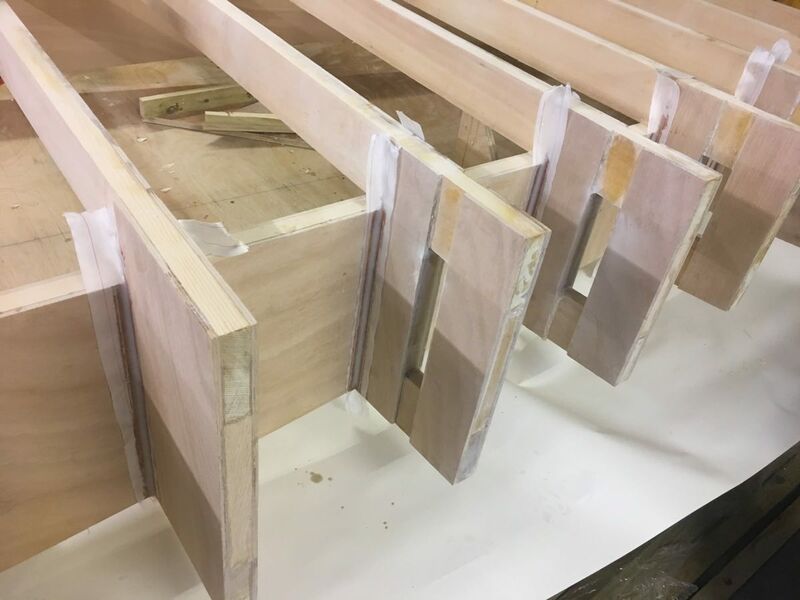 Before we could put the battens into place that run from bow to transom and are fixed to the timber frames periodically, we needed to form the frames for the bow itself which involves bending the wood and a whole lot of fun associated with it. 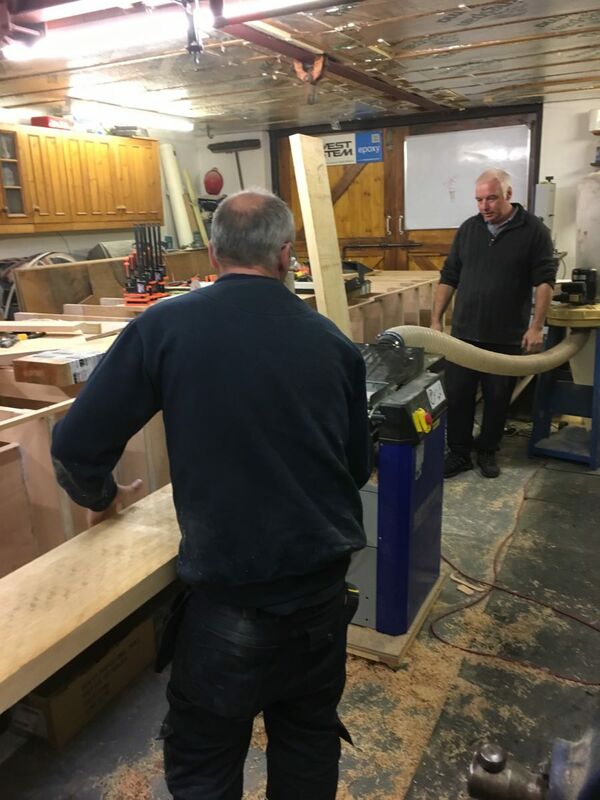 We hope you enjoyed this little update and please tune in next month to see how we got on with that stage of the build, as the hull for Longbow starts to come together. A British Team, with a serving British Military pilot at the helm, and a joint passion to build and run Longbow, a jet hydroplane, on lakes and lochs within the UK. Keep up to date with progress as we build our jet hydroplane, Longbow, then come and watch as we run Longbow right here in the UK. Find out how jet hydroplanes work, the outright water speed records these craft have won, and watch them challenge more records just for the thrill of it! Want to be notified when we launch a new story or article? Follow us on your favourite social media, and we'll post updates as they happen.